Largest wine region of Germany, producing about 20% of the country's wines. Located in the south, but still north of Alsace, this is also the warmest region of Germany. Palatinate, also known as Pfalz, is a particularly nice wine region for tourists. Travel the "wine road" which winds the length of the region, from Rheinhessen down to Weintor and the French border. Parts per million a comparative unit of small measure which is exactly as it sounds -- "parts per million parts of anything." For example, pounds of something per million pounds of something else, grams per million grams, etc. One red grain of sand among a million white grains is one part per million. One person in a million person city is 1 ppm. Louis Pasteur, the "father of modern winemaking, and pasteurized milk," did his famous research at the town of Arbois in France's Jura region. He correctly identified yeasts as the causative organisms for fermentation and developed a heat process (Pasteurization) for stabilizing wine, milk and other liquid foods from spoilage. Pasteur wrote, "Wine is the most healthful and hygienic of beverages." A semi sparkling wine with carbon dioxide added ,Perlwein is a carbonated wine with 1 - 2.5 atmospheres. The carbon dioxide is produced during fermentation and/or added before bottling. It is sold simply as Perlwein or, if the components are from one specified region, Qualitätsperlwein b.A. The German name for the arched cane training system . There is a 50-cm height difference between the end of the cane and the highest point, which is considered to improve budbreak in the middle of the cane. Most of the shoots are trained vertically upright between foliage wires, and normally require trimming at the top. Pendelbogen means pendulum bow, and there are related training forms called not just Halbbogen (half bow), but also Rundbogen (round bow) and Doppelbogen (double bow). The name has also been applied to a mid height Sylvoz system in New Zealand. The stem which attaches a leaf to its main branch or shoot. Petioles are well designed for conducting water, nutrients, sugars and mineral ions between the leaf and the rest of the vine. 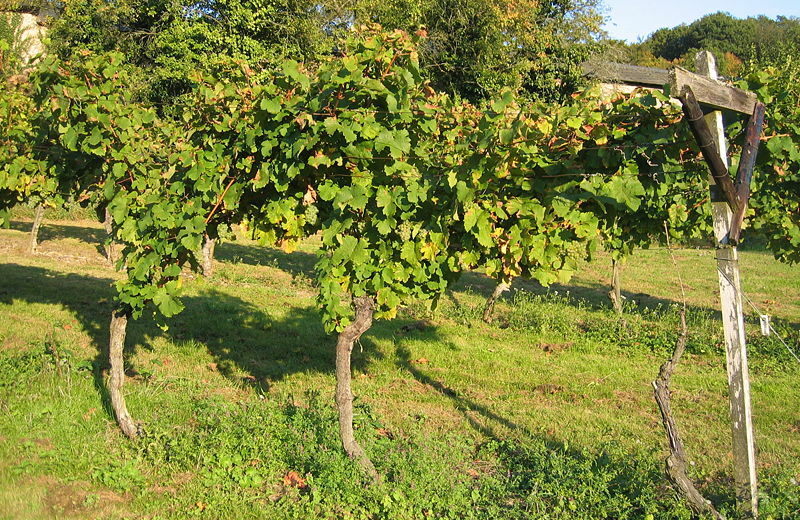 Vine trellising according to the Pfälzer Kammerbau system traditional to thePalatinate, where it was widely used until the 18th century. In an all-wooden version (without the steel wires), this system is supposed to date back to Roman times. A far from simple mathematical term for quantifying the concentration of hydrogen ions in a solution. pH is used as a measure of acidity in juice and wine. It is quite important to winemakers but its logarithmic scale makes it seem less so to the casual observer. Living plant tissue located just beneath the bark and outside of the cambium layer. Phloem cells conduct sugars and other organic materials downward from the leaves towards the trunk and roots. The formation of carbohydrates (sugars) in green tissue of living plants from CO2 and water. The reaction uses sunlight as its energy source and it is catalyzed by chlorophyll. 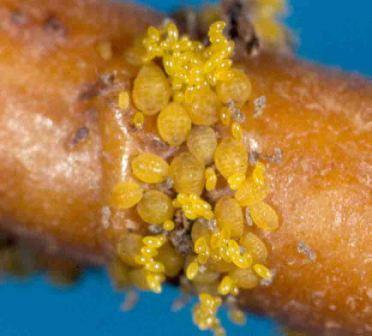 An otherwise beautiful, brilliant yellow, microscopic aphid which lives on vine roots by sucking their juice. Unfortunately this isn't very good for most roots. The aphid kills European wine varieties but native American vine roots are resistant. All the world's wine regions defeat Phylloxera not by chemicals, but by grafting the European wine varieties onto (resistant) American vine roots. Europe where ungrafted vines are allowed. This grape variety is planted in the Baden and the Rheinpfalz it is the same variety as grown in Alsace and is known here as the Weissburgunder or Weisser Burgunder. There are 2,600 ha planted and it produces a wine with lively fruit that goes well with many dishes. (white grape) Grown in the south of Germany in the area around Baden, which is just over the border to Alsace. This wine may be deep coloured as the grape skins have a red rust tinge. There are 2,800 ha under vine. The variety is also known as Grauer Burgunder and also Rulander, it is often vinified in small oak barrels. (red grape) Where grown in Germany it has the alias name Müllerebe. 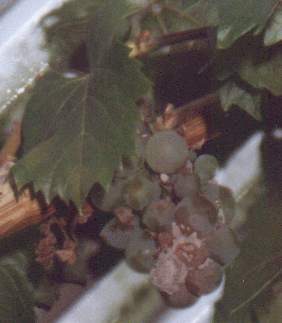 A mutation of this latter variety, known as the Samtrot, notable for characteristics closer to Pinot Noir clones, is also cultivated in certain N. American vineyards and Germany. Slang word for "the cheapest, poorest quality wine there is." Barely above the "drinkable" threshold, and then only if you're really hard up for wine. Chemical class of compounds which occur naturally in wine, giving the wine an astringent, bitter or mouth-drying taste sensation. Tannins and grape skin pigments are two prominent classes of polyphenols. The solid residue (primarily skins, seeds and stems) left behind by draining juice from white must, or draining new wine from a red fermentation tank. (red grape) also known as the Blauer Portugieser. Originally from Austria this grape produces light red wines low in acidity. French term for noble rot, or Botrytis cinerea. Fungal disease of grape vines which, unlike most fungal diseases, thrives in dry climates. Also called oidium, it occurs in most of the wine regions of the world. This is the most troublesome fungus disease of grapes in California by far. It can be controlled by timely application of sulfur dust directly onto the vine leaves and immature fruit. New fungicides have been introduced in recent years which greatly improve a vine's recovery from severe attacks. See Downey Mildew. water vapor dissolves in air when the air passes through humid areas. Later, when the air is cooled, the excess water vapor precipitates out as liquid, which falls out as rain. The juice obtained not by draining but by pressing fresh pomace. Is is usually far more tannic (often bitter) than drained or lightly pressed (free run) juice. Wine obtained by pressing newly fermented red wine from spent pomace. It is invariably more tannic (and infinitely more bitter) than free run wine. 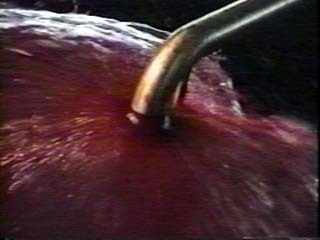 The act of squeezing the last remaining drops of juice or wine from pomace. Also, the machinery used to do such a thing. The spent pomace after pressing has removed all the usable juice or wine. 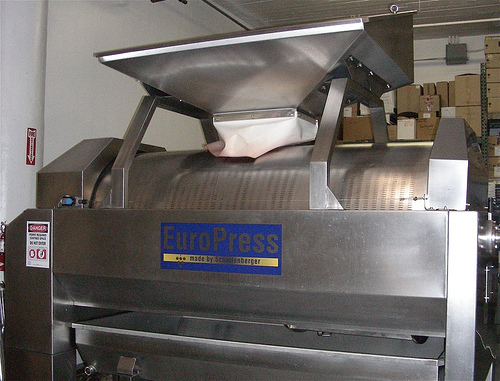 Pressed pomace can be sweet or dry, depending upon whether the pressing took place before or after fermentation was complete. The AP number contains the following information: 2 596 401 5 03 - The first digit, 2, represents the village testing station in which the wine was tasted. 2 in this case designates the village of Bernkastel. The following three digits, 596, represent the village where the estate is located, in this case 596 designates the village of Piesport. The third set of digits, 401, represent the grower identification number, grower's id number is 429 (this number is directly linked to the village number). The second to last digit, 5, is simply a number representing the order in which the estate presented its wine to the tasting panel. The last group of digits, 03, represent what year the wine was presented for approval, in this case 2003. The act of cutting off various parts of grape vines, usually in winter when the vines are dormant. 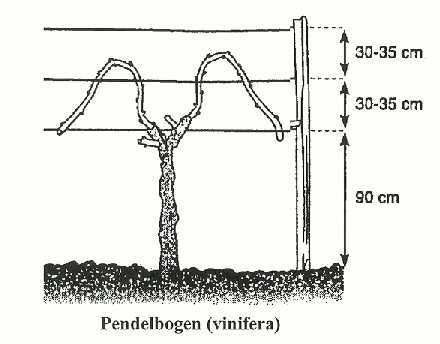 Pruning develops the shapes of vines when they are young and controls the growth, fruit quantity (and therefore, quality) of producing vines. To pump wine out from a lower valve of a fermenting tank up onto the top of the fermenting mass in order to keep the solid "cap" of skins wet. This is necessary during fermentation of red wine in order to achieve complete extraction of colour and flavour from the skins. To push the cap down into the fermenting liquid to wet it and facilitate colour and flavour extraction. This is the traditional method, but it can only be used for small tanks. Larger tanks are "pumped over." The concave indentation in the bottom of certain wine bottles, especially those containing sparkling wine. Several reasons for it may be found in literature collect crystals or sediment (this only works if the bottle is standing upright) so that the wine may be decanted easily; to add "apparent size" to a bottle which contains exactly the same measure as a bottle which lacks the punt; to facilitate snobbiness by allowing the sommelier to pour a wine flamboyantly, with his thumb in the punt and the bottle cradled in his other four fingers; etc, etc. Reason # 1 is arguably more correct than the others.